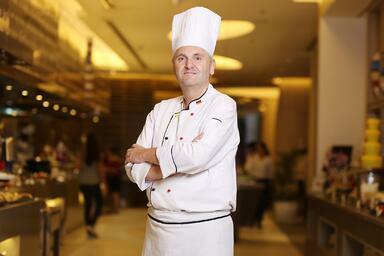 Araneta Center shares his inspiration to become a chef and much more. Graduating as Master of Culinary Art in Germany and Master in Hotel Management from Cornell University, USA, Chef Michael brings over 29 years of culinary experience to Novotel Manila Araneta Center. His previous assignments also include Kempinski Hotels in Dalian and Amman, Swissôtel Grand Efes in Izmir and the Semiramis InterContinental in Cairo. My mother was my main inspiration. When I was young she used to cook and bake great dishes for me. My favourites were her Christmas goodies, roasted rabbit and potato dumplings. I started my apprenticeship at a restaurant in Herbon, Germany and after that I had my examination to be a Chef at the Chamber of Commerce in Dillenburg. There was a time that I had to juggle being a sous chef, getting my master’s degree from The Chamber of Commerce in Frankfurt and taking the examination marker for the culinary Olympics. My general manager had really high expectations regarding this matter but the process wasn’t fast enough. When we started using Winnow in the kitchen there was a big improvement in my team. They felt more responsible and understood the importance of refilling the right quantity at our buffet. I ensure that all food containers are of efficient size to minimize the amount of leftovers and to reduce food waste. Plus, dishes like sushi and pizza are done a la minute during the last hour of every buffet. In terms of back of the house, technology make things consistent, faster and efficient. It can help the kitchen produce the right quantity needed without compromising the quality. I try to be observant and open to new ideas. I also go to different hotels and restaurants to experience what they have to offer, not just front of the house but also the heart of the house. From time to time I do research on the internet, read magazines and catch up with my colleagues to gather some fresh ideas. It is really ideal for me to source our own products from the local community and to help the surrounding community in looking for work, directly or indirectly. It has a multiplier effect and we all could benefit from each other. In terms of helping the environment, our kitchen doesn’t cook or serve endangered species, this is a real no go. Communication is the key, make sure that everyone knows what they’re doing and everyone is knowledgeable about your protocols. Make sure that your team is committed to reach the same goal. Michael Post's passion really inspired me from the time I was just a trainee up until now. Michael guided me all throughout my career as a chef. What’s your most recent fascination and why? (i.e an ingredient, technique)? The infectious passion to perfection of Novotel Manila’s culinary team, constant innovation in techniques, always striving for the best product and service quality. My best meal would be my mother’s roasted goose with red cabbage and potato dumplings. Handkäs mit Musik un Ebbelwoi- it is a marinated young cheese from the area of Frankfurt served with apple wine. I would definitely recommend “Zur Linde” in Greifenstein. It’s owned by my good friend Michael Post.